The life of a model is no easy life. Sure, Karina gets to jet around the world for photo shoots and travel around her own country to meet up with her fans, but this life can get pretty tiring after a while. Because of this, Karina makes sure that she has enough time to treat herself. She likes to take time off from work and relax in her own environment. 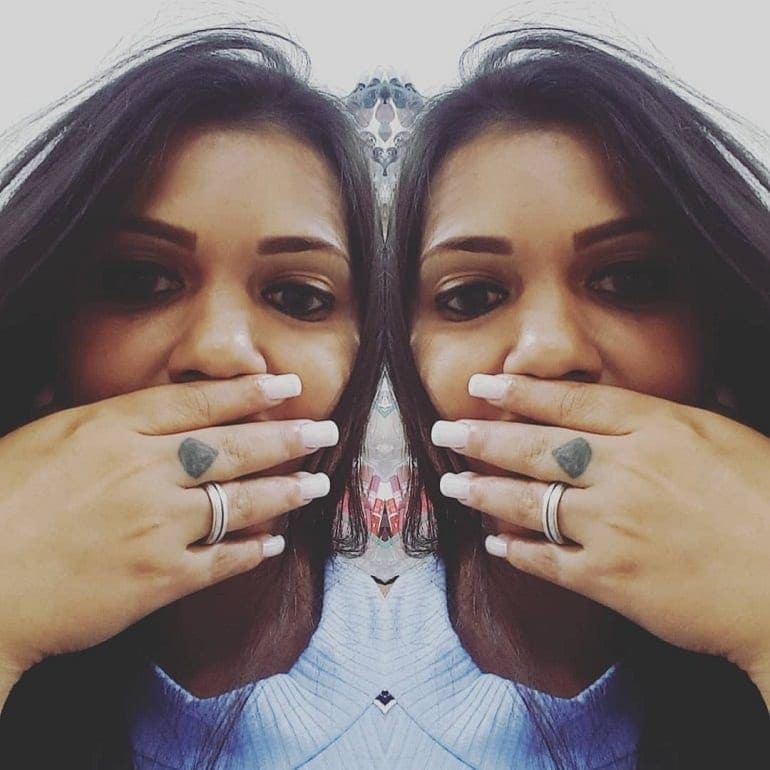 Whether she’s just chilling in jeans and a shirt at home, taking a trip to the hair salon or getting her nails done, she has perfected her work-life balance. If you’ve been keeping up with Karina’s life, you’ll know that she first came into our lives thanks to a video she posted on social media. In this video, she showed off her dance moves in a paddling pool; dancing to Gangnam Style with all of her friends around her. Thanks to this video, we were able to see that Karina really could wear anything and still look as fabulous as ever. Although it’s difficult to imagine that Brazil ever gets cold, Karina proves in this photo that she is ready for winter to come. The world has fallen in love with Karina Lemos, but there is one particular aspect of her appearance that has people fawning over her. Yes, her dazzling smile has wowed fans across the world, and she definitely gives them what they want. 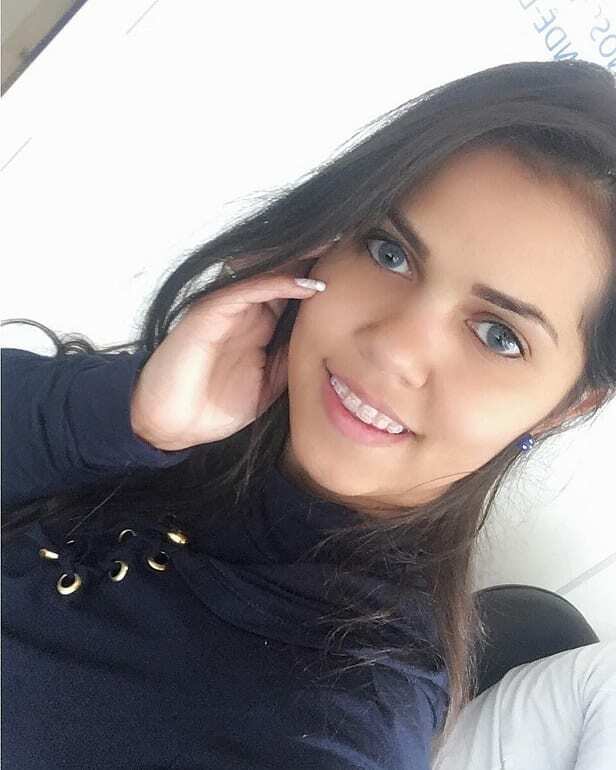 Karina is constantly uploading smiling selfies to her social media pages, and this one is definitely a fan favorite. 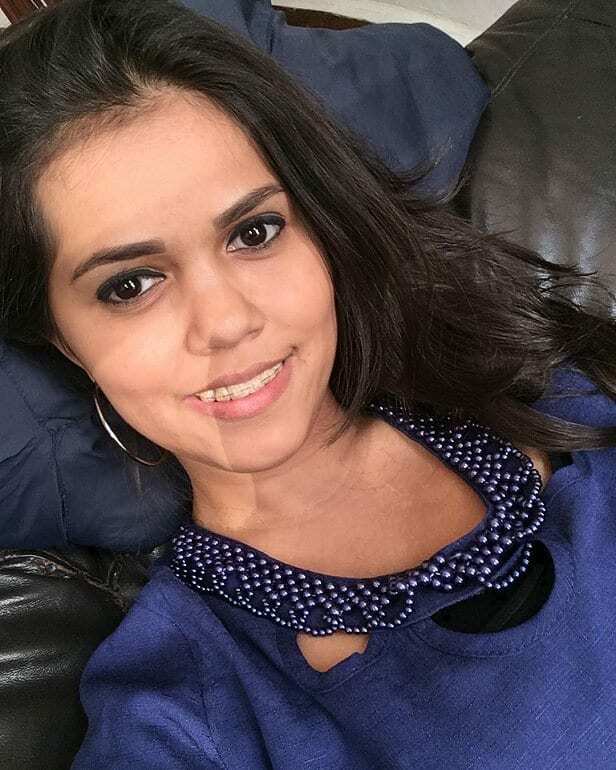 From the pearly whites to the expert makeup application, you could say that Karina has it all. 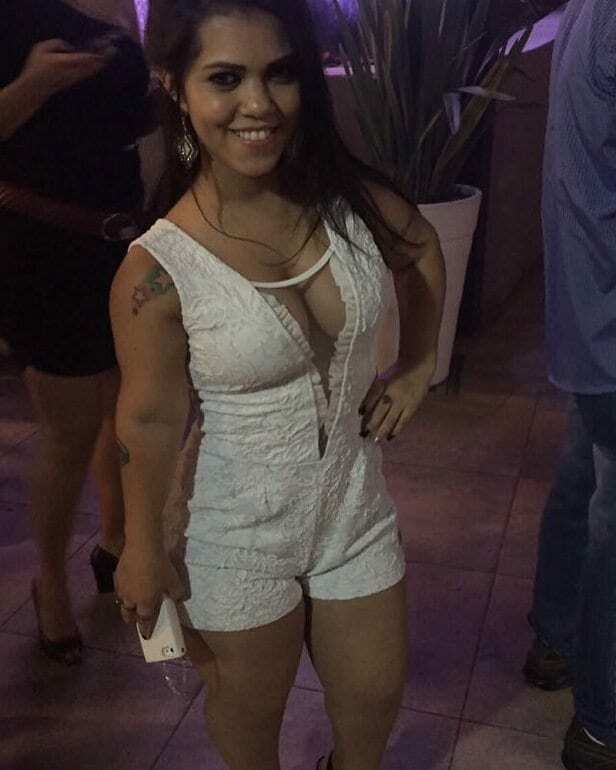 It’s no wonder she’s known as the world’s most beautiful dwarf. Everyone knows that to make a name for yourself, you need to be seen in the hottest spots and schmooze with the hottest people. Luckily, Karina has been given this chance over the course of her career. She regularly spends her evenings getting dolled up and going out on the town. She attends all of the latest nightclub openings, and she always makes sure that she gets papped. After all, when you look so good in a blue crop top and a black pair of shorts, why wouldn’t you want the whole world to see? Karina is not only the most beautiful dwarf in the world, but she’s also got a beautiful heart. 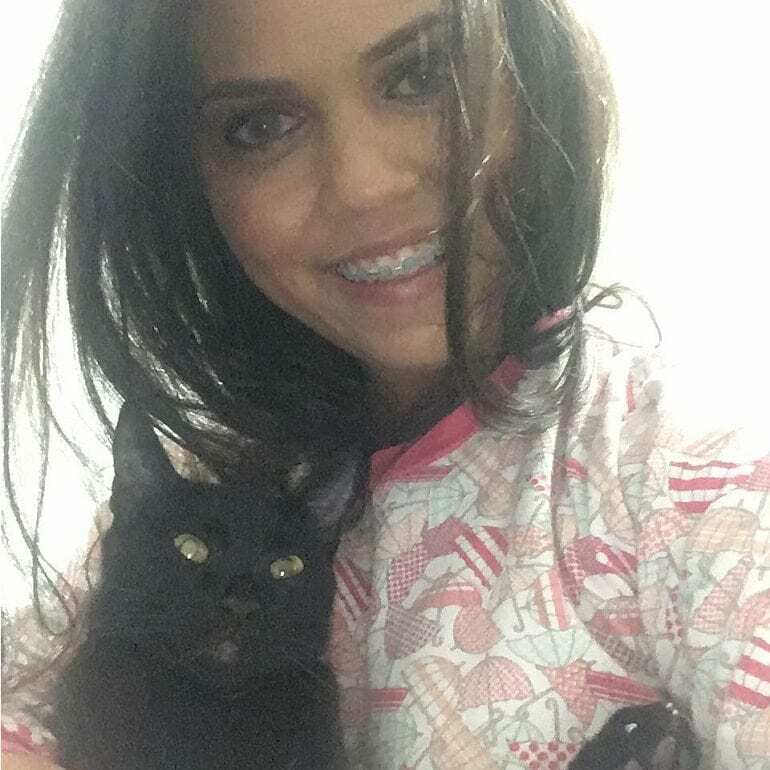 Alongside her high-profile modeling career and her social media stardom, Karina also shares her social media pages with the love of her life; her cat! 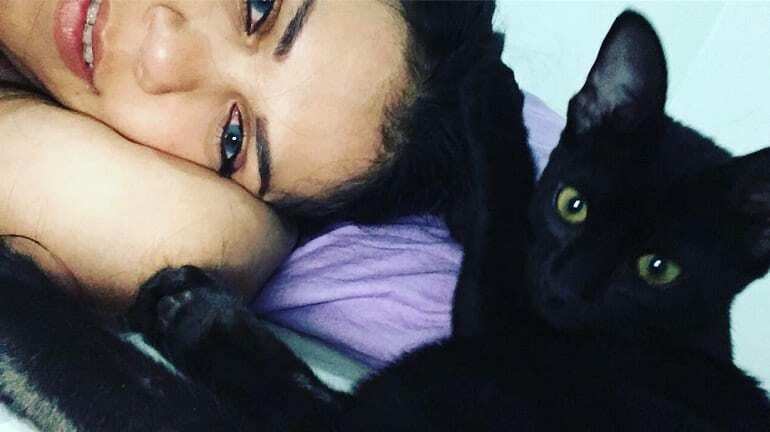 Karina regularly posts photographs of her feline friend, and she makes no secret of the fact that her black cat is one of the most important things in her life. These two spend every lazy minute together, and her cat has definitely learnt a thing or two from its owner about working the camera. When you’re choosing your outfit for a night on the town, you have to really think about what’s in your closet. You need to think about where you’re going, you need to think about what you’re doing, and you need to think about who you’re going to be seeing. When attending a nightclub event, most of us wouldn’t dare wear white. It’s too risky, right? However, it seems as though Karina isn’t too worried about getting a drink down her or slopping food down her dress. She knows she looks good, so she’s going to rock it. Although she lives a fairly busy and hectic life, Karina loves nothing more than a good old lazy day. She takes this time to rest and recuperate, and she uses this time to really catch up on her sleep. After all, even models have to put their feet up at some point. When Karina gets a rare day off, she lets her fans know just how much she’s enjoying it. She will post videos, she will post photographs, and she will post selfies just like this one that shows off her chill time. Sometimes all you want to do is hug your cat and watch the world go by, and it seems as though Karina has mastered this task. When she’s not sitting in makeup chairs or getting her hair professionally done, she loves to take it back to basics and wear her pajamas. Who doesn’t? What’s impressive about Karina, though, is that she doesn’t mind showing this side of her off to the world. She’s happy to open and honest about the two sides of her world. Brazil may be a huge place, but it seems as though everyone has heard Karina’s name in this country. They have seen her photoshoots, they have followed her on Instagram, or they might just see her walking down the street every once in a while. Because she is constantly trying to maintain her status in the world, Karina ensures that she’s ready for action at any point. With this blue shirt and white blazer, Karina is casual but cool and looks as beautiful as ever. Every single person on this planet has their own unique look and their own unique style, which means that they have to work different angles to get the perfect selfie. Some people rock the duck pout; others tend to take their selfie from above, while others tend to turn their heads to the side. Yet, Karina has got her own selfie style to work with. With a gentle touch to the side of her face and a flash of her dazzling teeth, she is a master of the camera. One of the main reasons we love to follow celebs on social media is because we get backstage access to their lives. We get to see what happens when they’re not in front of the camera, and we get to see what their real life is like. Karina is incredibly active on social media, and she loves nothing more than keeping her fans up to date with her daily activities. Most notably, she loves to keep her fans up to date with her outfits – including this lacy white ensemble. 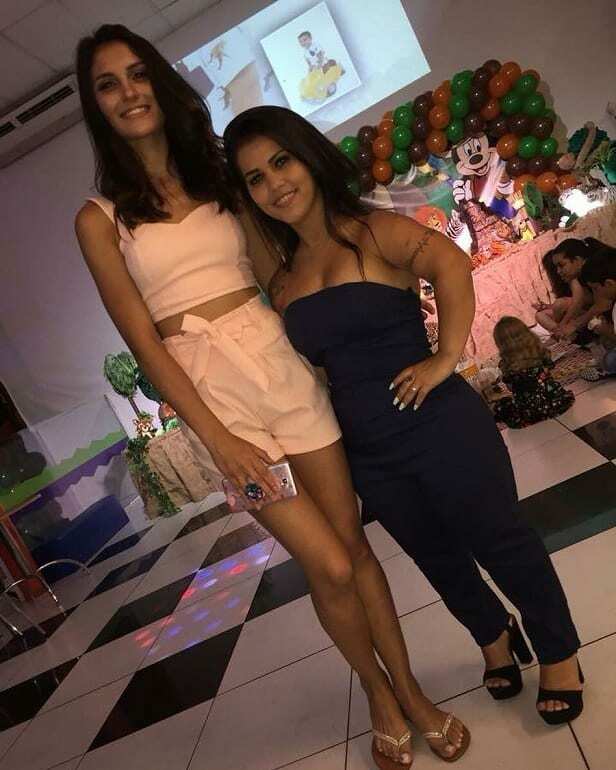 Most fans know Karina for being a social media sensation and for her modeling career, but it seems as though there is another side to the world’s most beautiful dwarf. Over the course of her career, Karina has been invited onto the sets of numerous talk shows where she is given the opportunity to open up about her experiences. 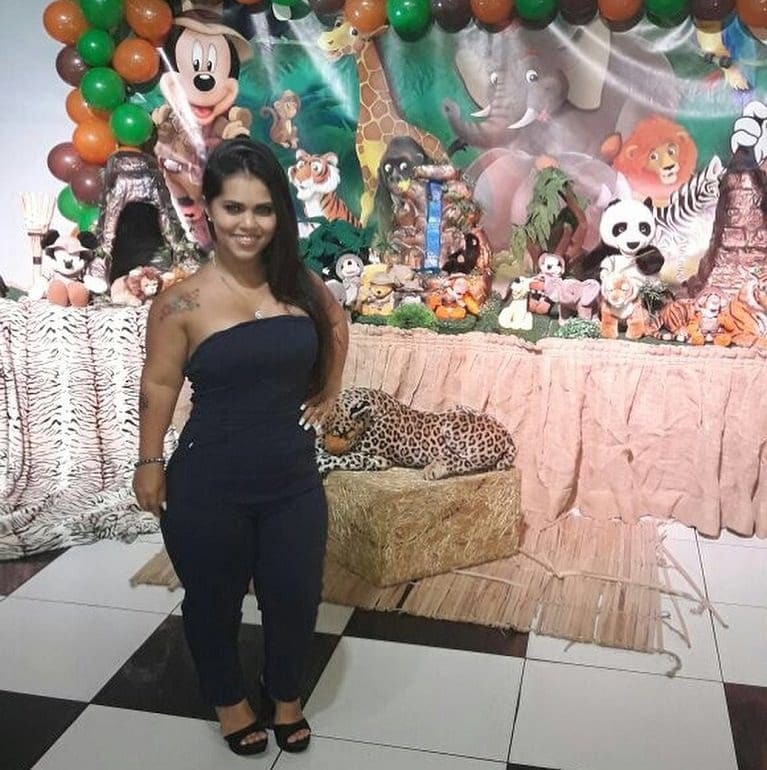 She also uses her platform to talk about people across the world with dwarfism, and how many stereotypes can have a negative effect on their self-esteem. To keep in shape and to maintain her figure, Karina spends a huge amount of time at the gym. She spends hours working out to keep on top of her figure, but it seems as though there might be another reason for this. When Karina fancies something sweet, she doesn’t like to deny herself of her cravings. 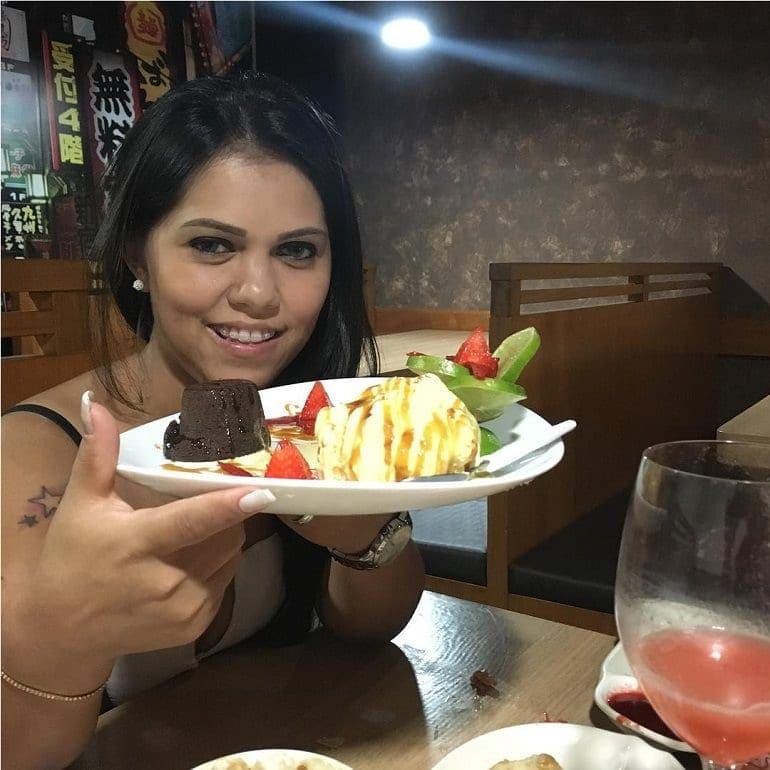 On this particular occasion, she decided that she wanted a sweet feast – so she got one! She can rest easy knowing that after this sweet feast, she can simply work it off in the gym the next day. When Karina uploaded the video of her dancing to social media, it was an instant hit. Within just a few weeks she had bumped up her numbers and expanded her social media following by a whopping 35,000 followers. Yet, this was just the start for the world’s most beautiful dwarf. Since then, Karina has been able to amass more than 170,000 followers who are all following the model to keep up to date with her life. After all, who wouldn’t want a little sneak peek into her life? Because she has such an incredible following on social media, Karina has been inundated with comments from people across the world who want to know a little more about her. They hope that they will be able to strike up a relationship with the model – and some people even want a little more. Yes, Karina has had some odd questions from fans over the years, but perhaps the most unusual question was for her hand in marriage. We hope Karina let them down gently because that would be one tough blow. In fact, Karina receives compliments from people across the globe every single day, and every post she uploads on social media brings in floods of comments. It seems as though people want to tell the world’s most beautiful dwarf that she really is as beautiful as her title. Over the course of her career, Karina has lost count of the number of men who have approached her in nightclubs or sent her a message on social media, because that’s just what her life is like. She’s now used to it. Sometimes we really wish that we had two stomachs; one for our main course and another for our dessert. Yet, it seems as though all of her hard work in the gym pays off for Karina when she goes to her favorite restaurants because she will always have a flick through the dessert menu. 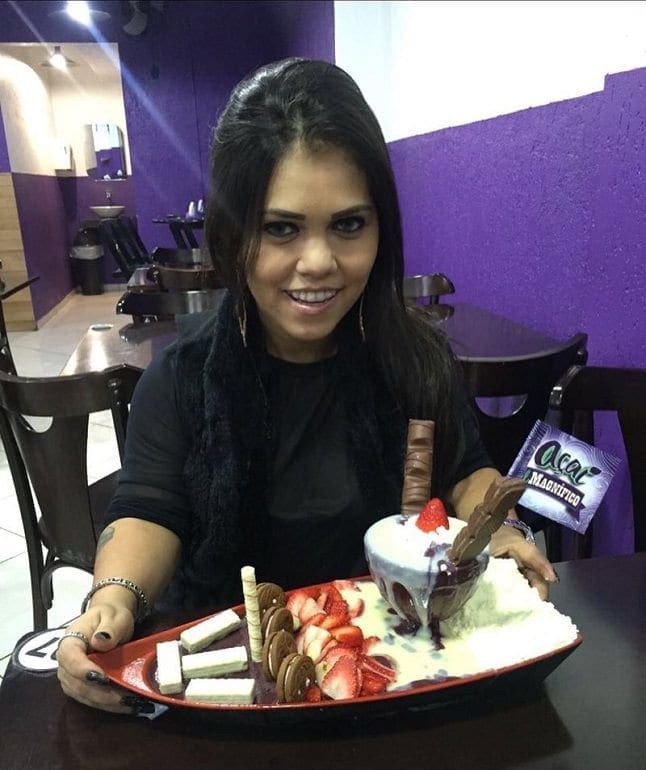 This chocolate cake and ice cream looks too good to pass up, so we don’t blame Karina for choosing it. In fact, we don’t even blame her for taking a photograph with it! Karina is always uploading new photographs to her social media accounts, but these aren’t just selfies with her cats or a snap of the latest dessert menu. Karina also likes to update her fans on her latest photoshoots, and she’s not shy about posting some professional photos on her profile. Rather than taking advantage of the professional lighting or the fancy filtering options, Karina keeps it simple by showing off her sleek and sophisticated outfits – just like this one. She always keeps it classy. If you’ve ever wondered how you create the perfect photograph, you might want to take a leaf out of Karina’s book. She has numerous techniques under her belt, but perhaps the greatest trick in her book is the fact that she always leaves her fans wanting more. This is especially true in this particular photograph, as Karina is showing off her impressive outfit while still leaving a little to the imagination. The sultry hair flick is just another trick to add to her repertoire. We think she’s nailed it. Like some of the best models in the business, Karina has the impressive ability to turn anything into a photo shoot. 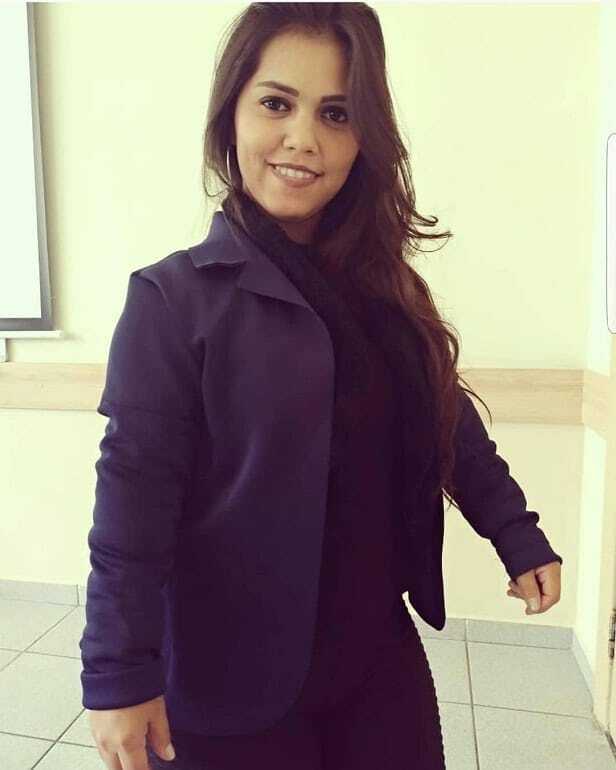 She looks professional, she looks beautiful, and her pose is always on point. This was the case when she decided to show off her new lacy shirt. Instead of taking a normal photograph that showcased the detailing, Karina decided to turn her selfie into something much more special. She’s even added a little bit of shimmer to her eyes to make it really pop. She looks stunning! Before her viral video took the internet by storm, Karina Lemos had tried to get her foot into the acting door. She had worked on numerous television shows, and she was used to standing in front of the camera. 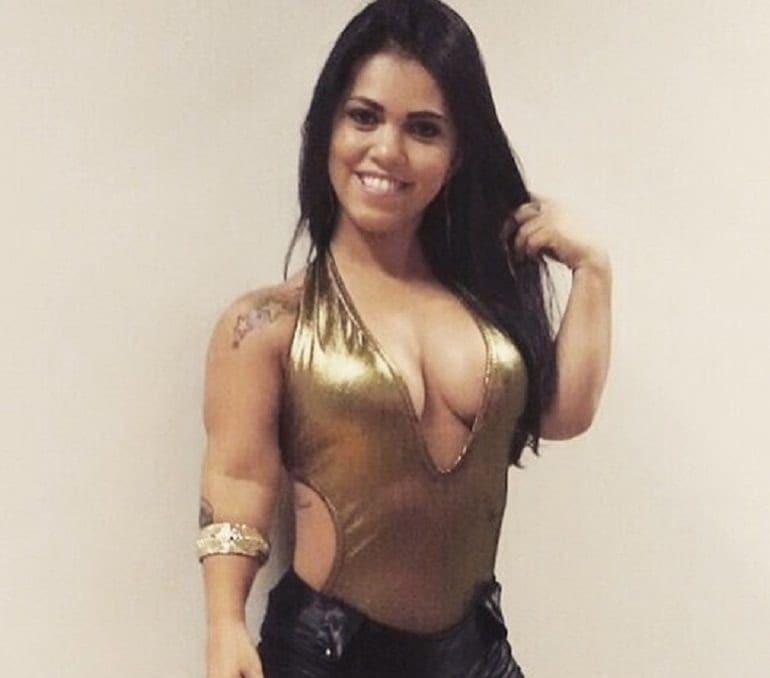 However, this video took her fame to new heights when it went viral, and she has since been asked onto the set of countless shows and talk shows to show off her fame and to talk about her dwarfism. This has allowed her fame to travel across the pond and reach others on an international level. Although many fans are used to seeing Karina in outfits that leave little to the imagination, she first rose to fame for a completely different style of outfit. She would often don her favorite Snow White or police officer costume and pose for the camera – and her fans would lap it up. While they appreciated that the woman on the screen in front of them was incredibly beautiful, they also appreciated the fact that Karina was extremely confident. She was not afraid to show off her body, and this was refreshing. Whenever Karina has an event to attend, her fans have a field day waiting for the moment that she unveils her outfit. That’s because this Brazilian is not afraid to try out new styles or wear things that other people may be too scared to wear. She has a whole selection of bodysuits and leotards in her closet, and they are all just as bright and colorful. This photograph shows just how incredible she looks in these kind of outfits, and it’s a rare photo of a night that she decided to go curly. We all feel a little blue from time to time, but it seems as though Karina Lemos doesn’t have any problems with plastering a smile on her face. Almost every photograph that she posts on her social media platforms feature her trademark smile, and they all show off her pearly white teeth. While she might not feel blue, that doesn’t stop Karina from wearing blue every once in a while. We particularly love this shirt, and the bead detailing brings out the blue in her eyeshadow. It’s all about the coordination. There are two kinds of people in the world; those that love sushi, and those that love to hate it. 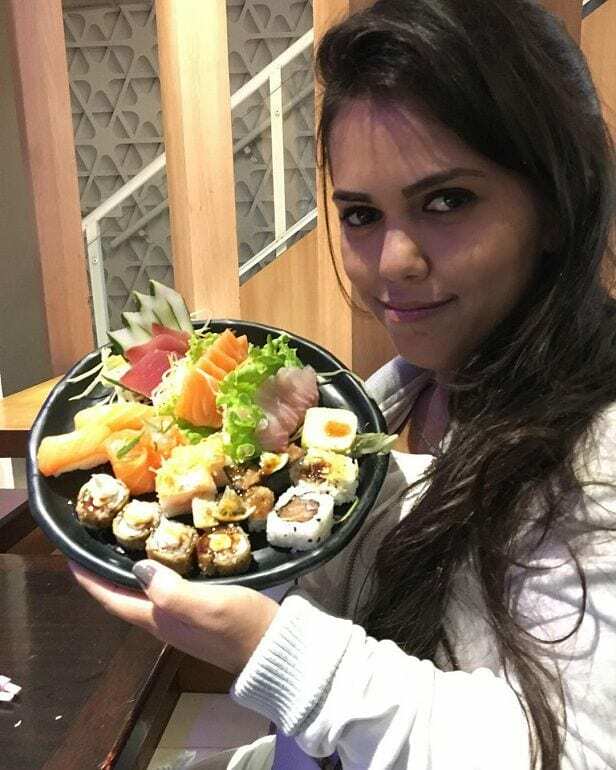 Although there are some people in this world who dislike this delicacy, it seems as though Karina loves nothing more than to chow down on a huge plate of sashimi and salmon rolls. Of course, we can’t blame her. As she intends to keep her body as healthy and possible and maintain her figure, the health benefits of sushi are bound to help this woman out. Although Karina has been hugely successful over the course of her career, that’s not to say that she hasn’t struggled in the past. Thankfully, she has been able to surround herself with a large group of friends who all want the best for her. They support her in every choice she makes, they pick her up when she’s feeling down, and most importantly, they attend some of her most prestigious events. This friend is obviously excited about their night on the town, and couldn’t help but plant a kiss on her cheek. Fashions come and go, and we were super happy to see that sportswear had become acceptable to wear in public. We no longer have to pretend as though we were going for a run to wear our yoga pants, and we don’t have to find an explanation for wearing sweatpants in public. It seems as though Karina also took full advantage of this new trend, as she decided to show off her comfortable style through this selfie. She definitely looks as though she is living the life right now. By now, you should know that Karina has a pretty close relationship with her cat. They spend their free time together, they take selfies together, and Karina just loves to spoil her beloved pet. However, it seems as though her cat was trying to keep her schtum during this photograph – because it just had to place a paw over her mouth. 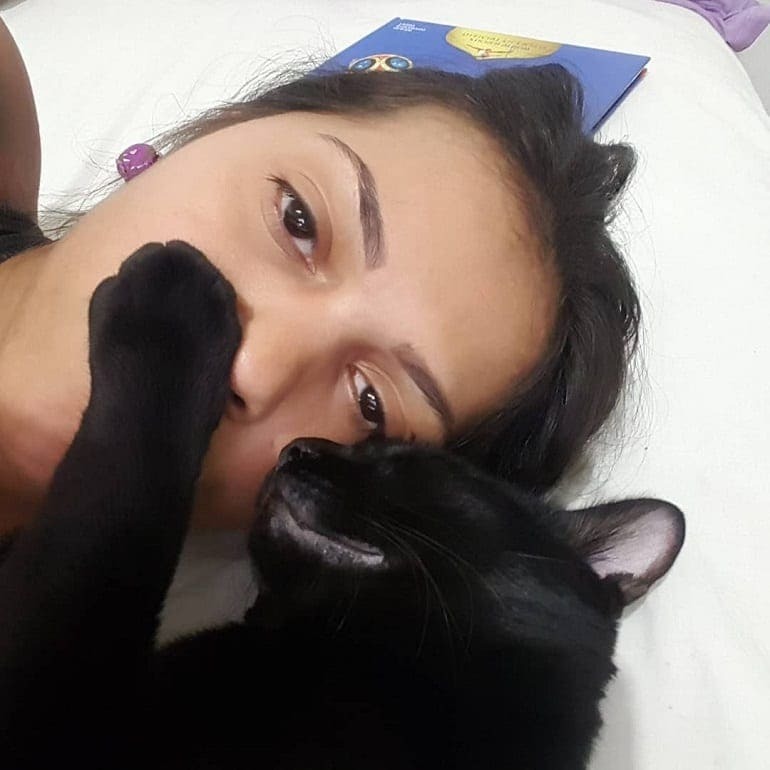 Perhaps her cat was just fed up of hearing about her day, but we can’t deny that this is an adorable photo of the pair of them. 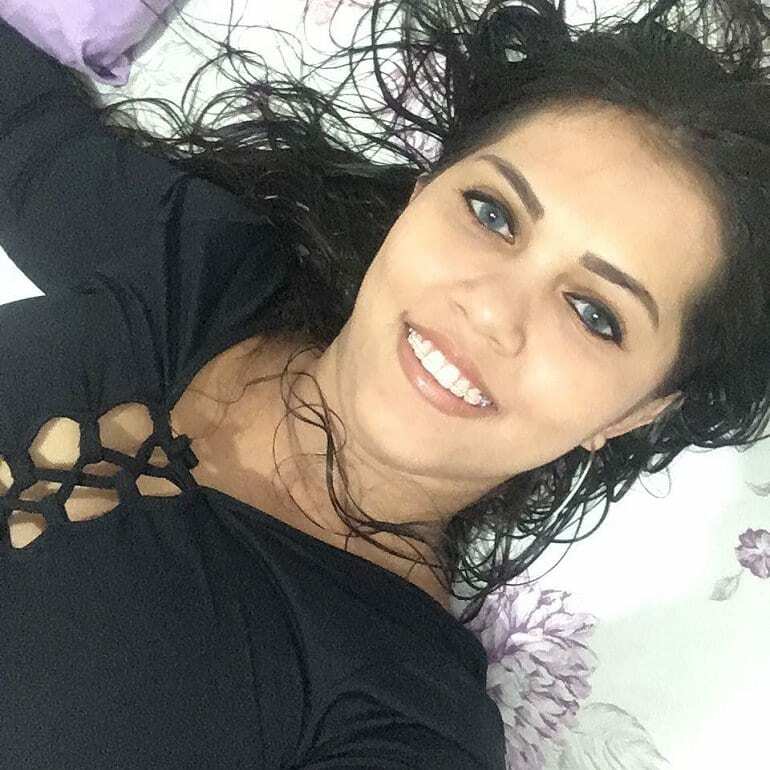 The whole world has fallen in love with Karina Lemos, and there are some fans across the globe who wish there were two of them. Well, she made her fans’ dreams come true in this selfie when she decided to use a mirror filter to clone herself. While this is an incredibly simple photograph, there’s something about Karina that makes it extra special. Perhaps it’s her eyes, perhaps it’s her pose, or perhaps it’s just the fact that she really is the most beautiful dwarf in the world. If you’ve been following Karina’s career, you’ll know that this Brazilian model has often sported a few accessories on her teeth. To ensure that her winning smile is always on point, Karina has opted to have braces fitted. She wants to make sure that her teeth are as straight as can be, and she decided to add a little metalwork into her appearance to make that happen. Although many people are self-conscious about their braces, Karina has always embraced them. 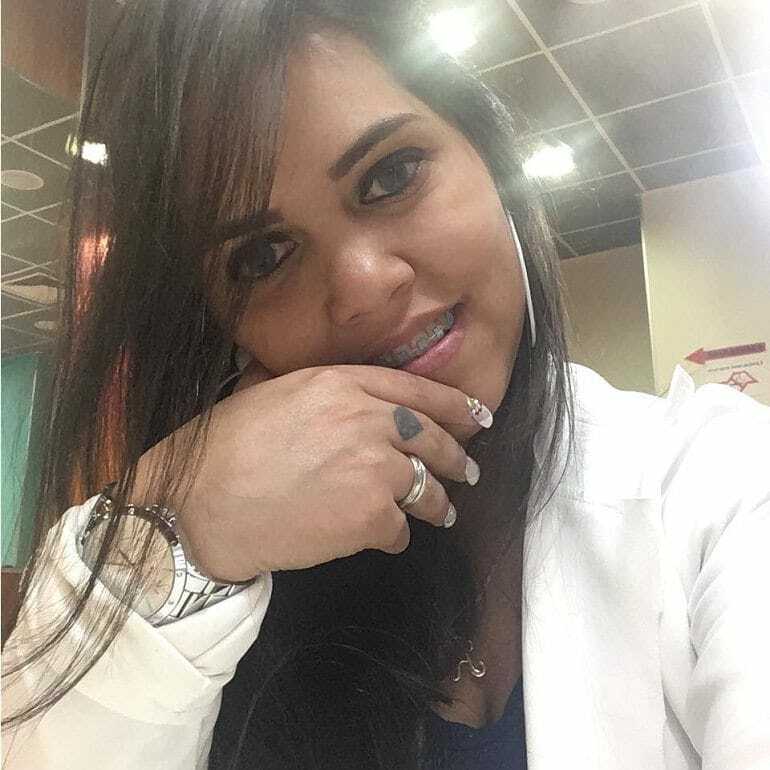 Both in Brazil and across the world, Karina has built up a devout fan following. 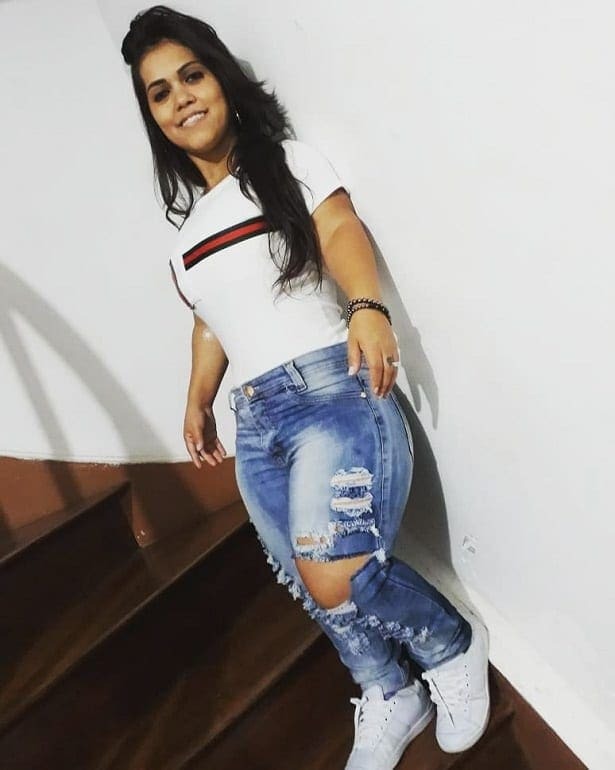 Many people follow her every move on social media, and there are some people who even follow her every move in person. As soon as her fans realize where she is going or which club she is going to attend, they make their way over and aim to get a selfie with the social media star. They’ll also try and nab an autograph whenever they can, because who wouldn’t want the autograph of the world’s most beautiful dwarf? Many celebrities simply sit back and wait for the job offers to come rolling in, but Karina Lemos isn’t going to leave her fame down to fate. Instead, she is intent on staying relevant for as long as possible, and she will happily put herself out there to obtain her own fame. To do this, she apparently reaches out to people on social media with her contact information, just in case they want to book her for their next party or event. There’s no doubt about it; she’s proactive. 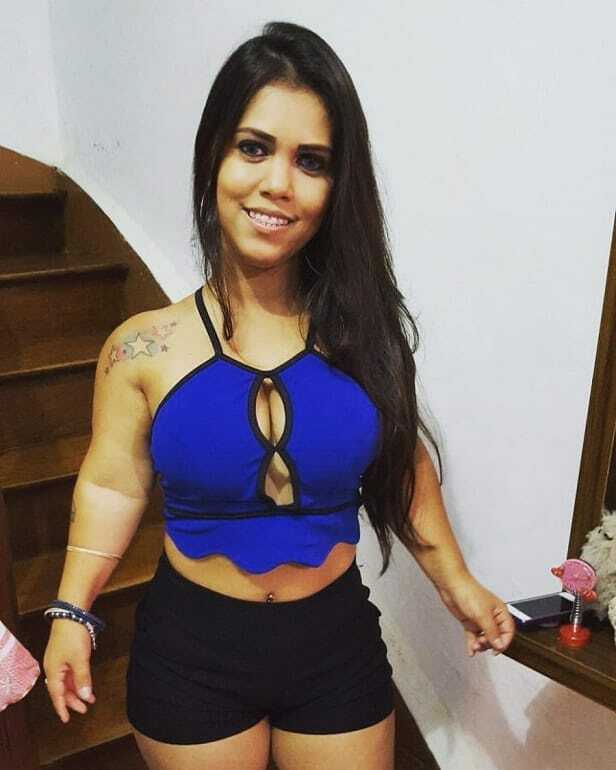 Karina Lemos is the name we will always associate with the most beautiful dwarf in the world, but it seems as though she’s not the only Karina on the scene. 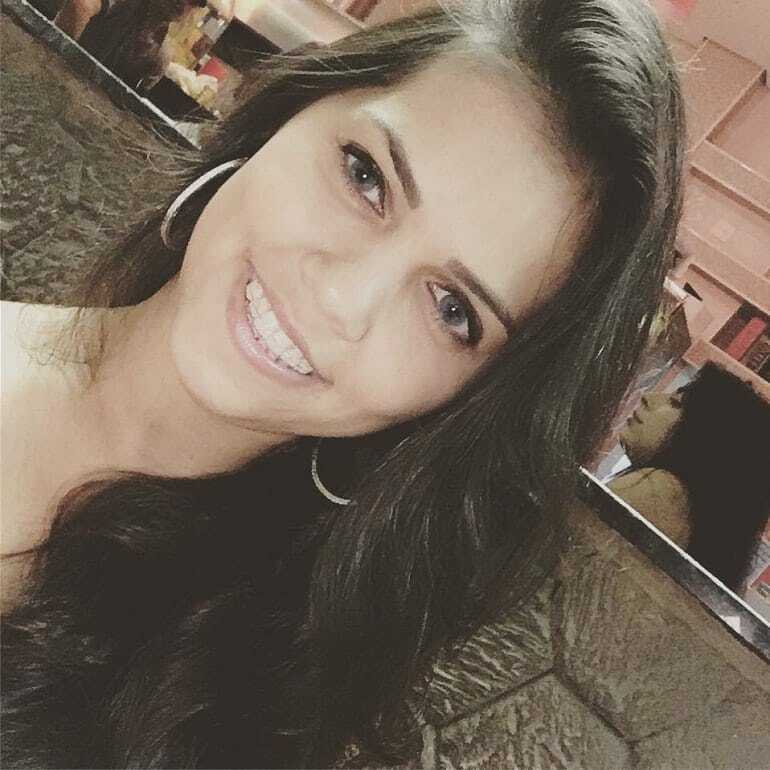 In 2014, Karina had some competition when another woman by the name of Karina Lemos won the Miss Costa Rica beauty pageant. 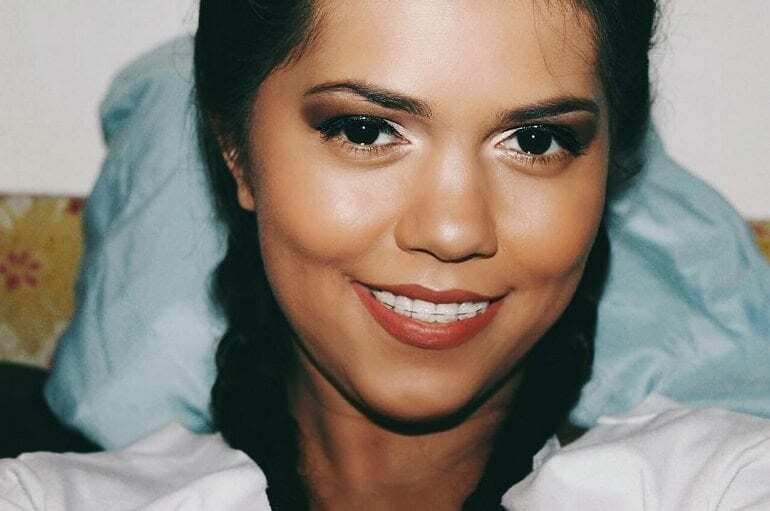 Although she later made her way to the Miss Universe pageant, she did not win – and the Karina Lemos fame was back in the hands of the true Karina Lemos.